Kyle wrote the book for this Broadway musical about the world's most famous yellow sponge. Directed by Tina Landau, it features original songs by a wide array of artists including The Flaming Lips, Aerosmith, T.I., John Legend, Sara Bareilles and Cyndi Lauper. The NY Times called it "Brilliant!" and it was cited as Best of the Year by Broadway.com, Chicago Tribune, Deadline, Forbes, Time Out New York and Variety. A musical collaboration with songwriter Duncan Sheik. It's 1942 on the Connecticut coast. Eleven-year-old Christopher's father has died in the war and he's sent to live with his aunt in a remote lighthouse. But this is not just any lighthouse: it's haunted. It premiered at the Old Globe Theater in 2010 and a significantly-revised new draft of the piece played at London's Other Palace Theatre in Spring 2017. You can get the songs from the show on an album from RCA/Victor. The LA Times says it's "Darkly enchanting... the show, a hybrid alt-rock concert-psychological ghost story, has a revivifying freshness." A rock-theater hybrid piece from Kyle's band Sky-Pony, it's a raucous ride exploring faith, doubt and the wild space in between. Directed by Tony nominee Sam Buntrock. The New York Times calls it "Defiantly exultant!" and The Village Voice says it's "a rock n roll right of passage belted with passion and verve." A new musical collaboration with Mark Mothersbaugh and skate legend Tony Hawk, based on the novel by Nick Hornby. It’s a funny, edgy coming-of-age story about 17-year-old Sam, a kid from a troubled background who finds refuge and hope in the world of skateboarding— and along the way, seeks guidance through imagined conversations with Tony Hawk, his idol. You can read the official announcement of this work-in-progress by clicking here. A new musical written with Duncan Sheik, inspired by radio plays and classic film noir. A heartbroken man never leaves his apartment, consoled only by the music on the radio. Through the thin walls, he hears almost every word of the couple next door—and before long, his eavesdropping becomes an obsession. Soon he finds himself drawn into a web of lust, lies, deceit and danger. It was part of the Powerhouse Theatre Season with NY Stage & Film and the NAMT Festival. A collaboration between Kyle and Clay McLeod Chapman. It's a a moody, moving, sometimes quite funny examination of two American hostages being held abroad. The piece has also been seen in NYC, Chicago, London and several regional US productions. Click here to read a feature article about it, and click here to see press quotes. Listen to a song: Let Him Be Good to You. "A blend of music and drama that is currently sweeping the alternative theatre scene," writes the Victoria Times-Colonist. It's Nebraska, 1958 and the world is closing in on Charlie Starkweather and Caril Fugate, teenage lovers charged with committing eleven murders. Under pressure to confess by dawn, facts blur and loyalties shift, and the question remains: how far will you go for someone you love? Listen to a song: When I Could Feel. An indie-rock musical co-authored with Nathan Leigh. A bittersweet rock and roll love story about roads not taken and dreams not followed. It premiered at Wellfleet Harbor Actors Theatre. You can buy the cast album here. The Boston Globe writes "All of the songs are terrific... 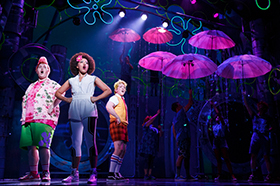 Lighthearted as it may seem on the surface, this musical proves surprisingly insightful when it comes to the choices we all must face on the road to adulthood." Listen to a song: All That You're Touching is Skin. "Jarrow's philosophical fable has an antic charm," writes Variety. Waking one morning to find thick fur growing on the backs of his hands, young Billy discovers the awful truth his mother has been hiding from him for 14 years. It's a darkly comic coming-of-age tale. Script available from Samuel French. Listen to a song: Gorilla Man. "Affecting comedy... Jarrow builds on his reputation as a playwright both droll and humane," writes The Village Voice. A provocative farce about notions of personal freedom and medical ethics. It premiered at the New York International Fringe Festival and it's played in Chicago as well. Kyle adapted it into a feature film which was an official selection of the Sundance Film Festival 2010 (dir. Habib Azar). You can buy a copy of the playscript here. "A cult-hit blueprint for a young generation that prefers its irony delivered with not a wink but a blank stare," says The New York Times. A jubilant cast of children celebrate the controversial religion in uplifting pageantry and song. The actual teachings of The Church of Scientology are explained and dissected against the candy-colored backdrop of a traditional nativity play. Produced by Les Freres Corbusier at The Tank and The John Houseman Theatre in November 2003-January 2004. It's been all over the country since then. Script available from Samuel French. Listen to a song: The Way That It Began. "A darkly funny, provocative play about placing blame and struggling to survive tragedy," says Broadway World. When Ryan's wife gets in a crippling car accident while he's in bed with another woman, he begins to wonder: do his actions have the power to cause disaster? It's had productions in Boston, NYC and Los Angeles. A pulpy dark comedy about a hypochondriac, a serial killer, a detective, and a man who believes he's Marilyn Monroe. The piece explores modern society's obsessions with celebrity, trauma, and tragedy with lying, killing and dying.